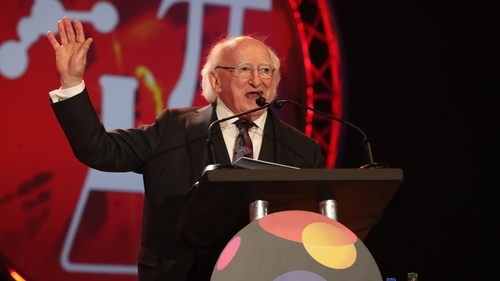 President Michael D. Higgins launches this year's BT Young Scientist and Technology Exhibition. News At One reports from the opening day at the BT Young Scientist and Technology Exhibition 2018. The BT Young Scientist & Technology Exhibition is much more than a competition; it is an unforgettable experience of a lifetime for the students who take part. The Exhibition itself is the final stage in the competition, which is open to all second level students from Ireland, both north and south. As well as the student projects on display, there are a further four exhibition halls filled with science and technology based exhibits and entertainment, making it a thrilling event for those who entered and for general visitors too.